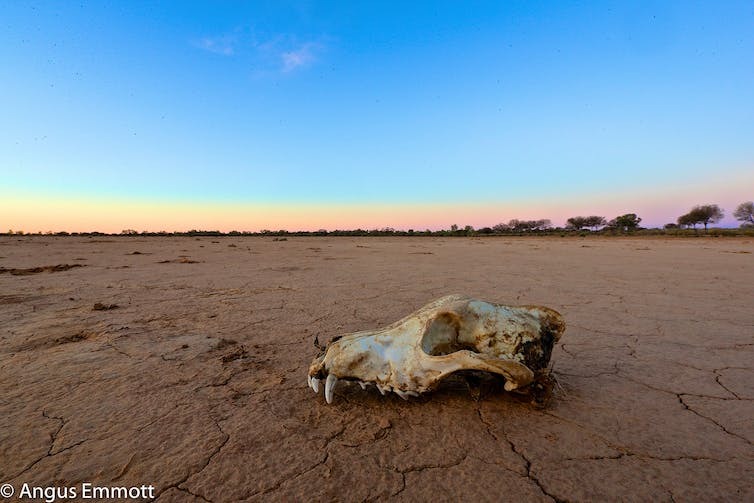 Australia has a complex relationship with the dingo. 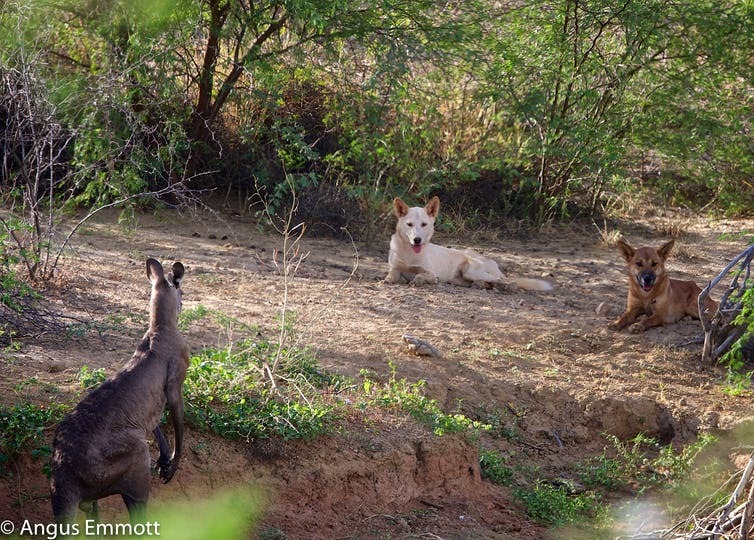 Dingoes are known to be very effective at controlling kangaroo populations. Kangaroos can become very abundant following rain and without control by dingoes. Euan Ritchie would like to acknowledge the contribution of Angus Emmott to this article. The risk of more severe storms and cyclones in the highly urbanised coastal areas of Newcastle, Sydney and Wollongong might not be acute, but it is a real future threat with the further warming of the southern Pacific Ocean. One day a major storm – whether an East Coast Low or even a cyclone – could hit Sydney. With higher ocean temperatures killing and bleaching coral along the Great Barrier Reef to the north, we could also imagine where the right temperatures for a coral reef would be in a warmer climate. Most probably, this would be closer to the limits of the low latitudes, hence in front of the Sydney metro area. 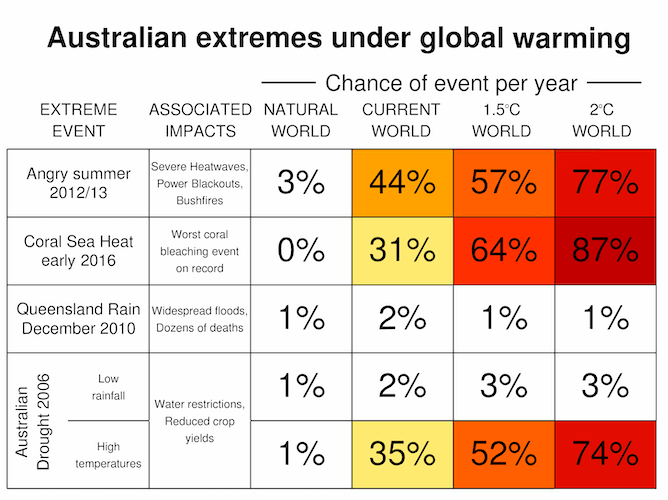 We should then consider whether it is possible to help engineer a natural defence against storms, a barrier reef, should warming oceans make conditions suitable here. The oceans are clearly warming at an alarming rate, with the unprecedented extent and intensity of coral bleaching events a marker of rising temperatures. 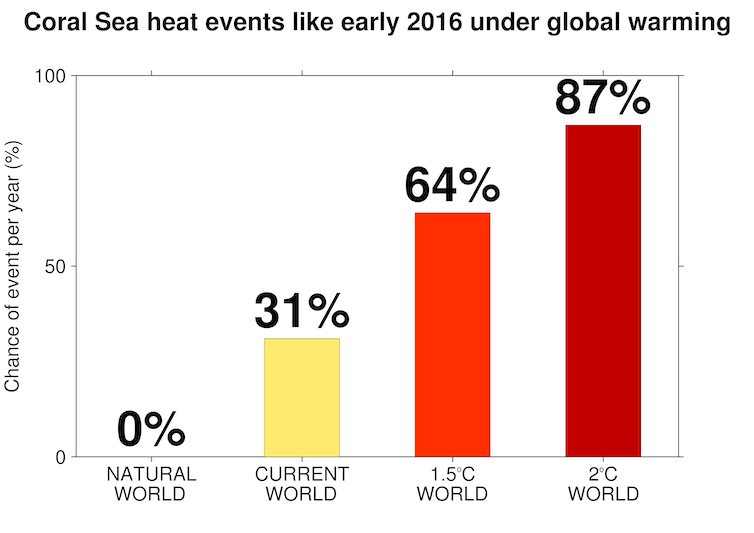 After the 2016-2017 summer, coral bleaching affected two-thirds of the Great Barrier Reef. On the other side of the Pacific, sea surface temperatures off Peru’s northern coast have risen 5-6℃ degrees above normal. Beneath the ocean surface, the warming trend is consistent too. The East Australian Current keeps the waters around Lord Howe Island warm enough to sustain Australia’s southernmost coral reef. The waters off Sydney are just a degree or two cooler. With the East Australian Current now extending further south, the warming of these south-eastern coastal waters might be enough in a couple of decades for Nemo to swim in reality under Sydney Harbour Bridge. This shift in ocean temperatures is expected to drive strong storms and inland floods, according to meteorologists. On top of this, when we plot a series of maps since 1997 of cyclone tracks across the Pacific, it shows a slight shift to more southern routes. These cyclones occur only in the Tasman Sea and way out from the coast, but, still, there is a tendency to move further south. The northern part of New Zealand recently experienced the impacts this could have. If we would like to prevent what Sandy did to New York, we need to think big. If we don’t want a storm surge entering Parramatta River, flooding the low-lying areas along the peninsulas, if we don’t want flash-flooding events as result of river discharges, if we don’t want our beaches to be washed away, if we want to keep our property along the water, and if we want to save lives, we’d better prepare to counter these potential events through anticipating their occurrence. The coast is the first point where a storm impacts the city. Building higher and stronger dams have proven to be counterproductive. Once the dam breaks or overflows the damage is huge. Instead we should use the self-regenerating defensive powers nature offers us. Thinking big, we could design a “Sydney Barrier Reef”, which allows nature to regenerate and create a strong and valuable coast. The first 30-40 kilometres of the Pacific plateau is shallow enough to establish an artificial reef. The foundations of this new Sydney Barrier Reef could consist of a series of concrete, iron or wooden structures, placed on the continental shelf, just beneath the water surface. Intelligently composed to allow the ocean to bring plants, fish and sand to attach to those structures, it would then start to grow as the base for new coral. Over decades a natural reef will grow. Coral will develop and a new ecosystem will emerge. This reef will protect the coast and create new sandbanks, shallow areas and eventually barrier islands, as the Great Barrier Reef has done. It will increase the beach area, because the conditions behind the reef will allow sediments to settle. It creates new surfing conditions as a result of the sandbanks. It will protect Sydney from the most severe storm surges as it breaks the surge. It will present a new tourist attraction of international allure. Let’s create a pilot project as a test. Let’s start to design and model the pilot to investigate what happens in this particular location. Let’s simulate the increase of temperature over time and model the impact of a cyclone. Let’s create, so when Sandy hits Sydney, we will be better protected.